Essex Estuaries SAC is a 472 km2 site which was initially designated for six Annex I habitat features under the EU habitats directive. The seventh feature, subtidal sandbanks, is present as a qualifying feature but not a primary reason for selection of this site. Thirty percent of the SAC is comprised of marine areas and sea inlets, 56.5% is tidal rivers, estuaries, mud flats, sand flats, and lagoons (including saltwork basins), 11% is saltmarshes, salt pastures and salt steppes, 2% is improved grassland and the remaining 0.5% is composed of shingle, sea cliffs and islets (JNCC, 2015). Saltmarshes nationally are under pressure from ‘coastal squeeze’, with coastal developments and flood defences constraining the ability of saltmarsh habitats to naturally move landward in response to sea-level rises (Natural England, 2006). Approximately 3,500 hectares, or 8%, of the UKs saltmarsh resource lies within the SAC boundaries (Natural England, 2000). Saltmarshes in Essex Estuaries contain nationally scarce species including small cordgrass (Spartina maritima) and smooth cordgrass (S. alterniflora). This site encompasses the extensive intertidal flats of the Colne, Blackwater, Roach and Crouch, as well as the tidal flats at Foulness, Maplin and Dengie. The flat communities within this site cover a wide range of sediments, including mud, muddy sand and clean sand (Natural England, 2000). Mud communities are found in the upper reaches of the river, where variable salinity leads to impoverished communities (Natural England, 2000). Further down river, communities in sandy mud are more diverse, including marine bristle worms, Baltic tellins, cockles and mud snails. Muddy sand communities occur towards the mouth of the estuaries support a 58 hectare nationally-important bed of dwarf eelgrass (Zostera marina) on Maplin sands, as well as a nationally important cockle fishery (Natural England, 2000). Sand and gravel flats are often subject to a high degree of mobility and few invertebrates tolerate this environment (Natural England, 2000). Estuaries are defined as partially enclosed tidal areas at least partly composed of soft tidal areas, with saline influence from the sea and fresh water influence from rivers, land run-off or seepage through embankments (Natural England, 2000). Essex Estuaries SAC is the second largest estuarine site on the east coast of England, and encompasses the major estuaries of the Colne, Blackwater, Crouch and Roach. (Natural England, 2000) A dynamic system, estuaries contain an interlinking and interdependent mosaic of habitats. Much of the estuary floor is characterised by shallow subtidal mud communities dominated by marine worms and Baltic tellins while subtidal muddy sand is dominated by bivalve molluscs (Natural England, 2000). 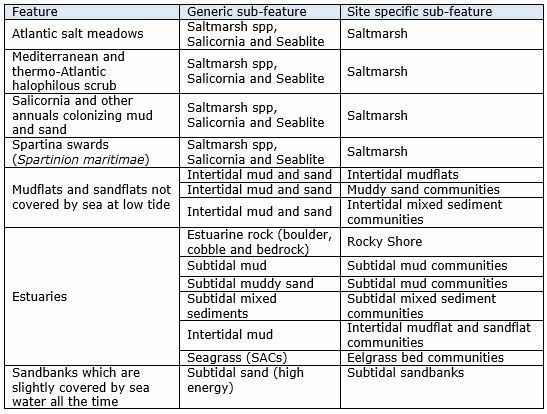 While soft substrates such as mud and sand dominate Essex Estuaries SAC, there are also areas of hard substrate (Natural England, 2000). Areas on intertidal boulder and cobbles support diverse communities, as sedentary species including seaweeds, hydroids and sponges can gain a foothold. The long history of oyster cultivation in Essex Estuaries has resulted in the presence of oyster ‘culch’ (cockle or clipper limit shells) covering large areas of the seabed (Natural England, 2000). Subtidal sandbanks in Essex Estuaries are typically composed of gravelly and clean sands and are found in high energy environments. KEIFCA is responsible for assessing the effects of commercial fishing within this site and must implement appropriate conservation measures to avoid damage to EMS by fisheries activities. 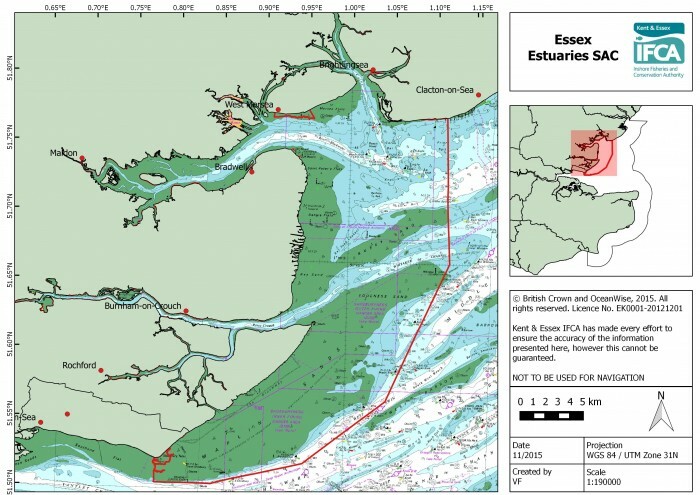 In Essex Estuaries SAC an area where intertidal seagrass occurs has been identified as at risk of damage from bottom towed fishing gear, and in response KEIFCA have implemented a Byelaw prohibiting the use of this gear over the seagrass feature.